A very fine Oval cut Blue Sapphire and fine round brilliant diamond set in Platinum Ring for KAMLA YOGH, Success, Prosperity, Luxuries, Professional independence, Financial Independence, Properties, Assets, Economical success, Rising, Performance, Achievements, Rewards, Determination, Creativities, Vision and Drive. This ring has the power to awaken the giant inside you and enhance your productivity and effectiveness considerably. This ring is most suitable for those whose rising sign ascendant is Capricorn, Aquarius, Taurus, Libra & Virgo. 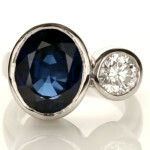 The Blue Sapphire and Diamond gemstones are especially unique and precious. Blue sapphire represents the planet Saturn (Shani) and is a very powerful and effective gemstone which gives such an effect to the wearer that he or she can achieve unheard of success of a grand magnitude. It is of paramount importance that one gets an accurate and expert reading of his or her horoscope by an experienced Astrologer before wearing this ring.